Toys for Kids Foundation is proud to host another beautiful evening in care of the children of Bay County, Florida. With our community in healing after a hard punch by Hurricane Michael, we will not be celebrating as we typically do. Instead we will gather together without the black tie attire as friends and neighbors uniting for the children. Yes, the dress code will be more relaxed, but the rest of the evening will be in true Toys for Kids Foundation's style & taste. Please dress in Holiday Festive Attire. No jeans allowed entry and all guests must be 21 years or older. Spirit of Community defines the who, what and why of this year's Christmas Ball. Please join us for a wonderful evening shared by wonderful people. Thank you for your interest in helping the children of our community. With your involvement we will succeed in your quest. If you need more information or have a comment or concern or simply want to say hello to our founder, Chris Moates, please click the email button below. We would like to take a moment and thank our presenting sponsor, Ramey Law Office. Their enthusiasm and desire to help us with such a monumental task this year energized us to host this 21st annual event. We were left feeling deflated and without a direction after Hurricane Michael but the entire team at Ramey Law Office pushed us to go, go go. Thanks so much for caring about our community and all of the kids so greatly affected this year. 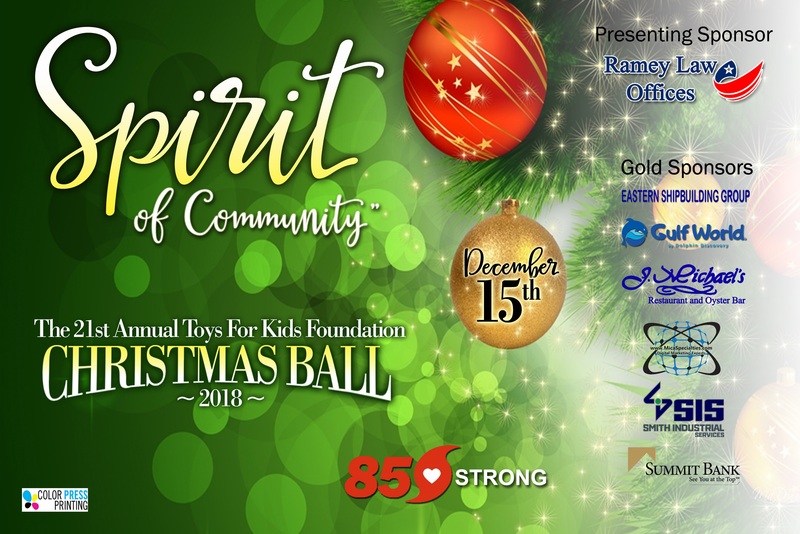 Along with our presenting sponsor, we could not host this Christmas Ball each year without a massive support system, which includes our helpers and their families and dozens of businesses aligned with our purpose and directives for Toys for Kids Foundation. Our Gold Sponsors this year includes: Eastern Shipbuilding Group, Gulf World, J. Michael's Restaurant and Oyster Bar, Mica Specialties, Smith Industrial Services and Summit Bank. We extent a sincere THANK YOU to each of this generous businesses. Last, but not least, we absolutely want to thank each of our Silver Sponsors for 2018. It's the teamwork of every single person and business that makes our hearts full. Please visit our Sponsors Page for the complete list of sponsors for Toys for Kids Foundation 2018. We're very social and we hope you will be social with us, too. Go ahead, give us a try and you'll see how friendly we are. Copyright © 2018. Toys For Kids Foundation. All right reserved.